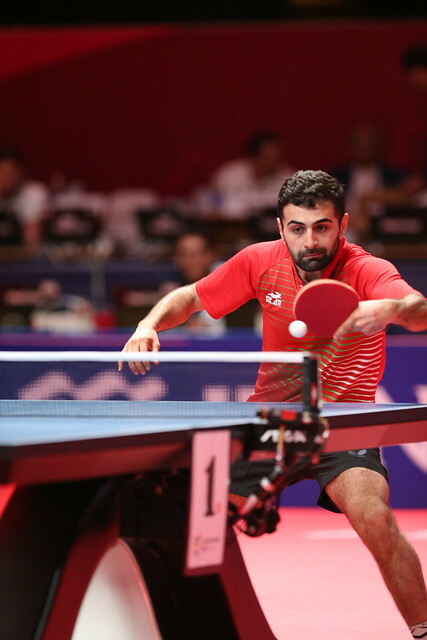 An opening day unbeaten; such was the situation for the leading outfits in the Men’s Team event at the 2018 Asian Games in Jakarta, Indonesia on Sunday 26th August. Fixtures still to be completed in each of the four groups but China, Japan, Korea Republic and Chinese Taipei can look forward to places in the quarter-final draw as their status advised. Three wins and no defeats was the outcome. Notably China and Japan, the respective top two seeds, experienced minimal problems; for Korea Republic and Chinese Taipei, the next in line, life was different. Both were stretched the full five match distance. Chinese Taipei found India’s Sharath Kamal Achanta, Sathiyan Gnanasekaran and Harmeet Desai more than worthy opponents; the voice of experience proving the backbone of success, the exuberance of youth sealing the victory. Chuang Chih-Yuan, 37 years of age, beat both Sathiyan Gnanasekaran (12-10, 11-9, 11-9) and Sharath Kamal Achanta (11-1, 11-8, 10-12, 11-1) to set the scene for 17 year old Lin Yun-Ju to seal the victory in the fifth and vital match of the engagement. He duly obliged, he accounted for Sathiyan Gnanasekaran in four games (11-9, 4-11, 11-9, 11-9). The wins for India were gained in the opening match of the contest when Sharath Kamal Achanta beat Lin Yun-Ju (11-8, 5-11, 12-10, 11-8) and in the third match when Harmeet Desai excelled expectations to overcome Chen Chien-An by the very narrowest of five games margins (11-7, 10-12, 11-7, 7-11, 13-11). Likewise for Korea Republic’s Jeoung Yougsik, Lee Sangsu and Jang Woojin, there were testing times; the player to cause the problems being Wong Chun Ting in the contest against Hong Kong. He beat both Jeoung Youngsik (11-9, 8-11, 11-5, 12-10) and Lee Sangsu (13-11, 6-11, 11-9, 6-11, 11-8). Alas for Hong Kong those were the only wins; Ho Kwan Kit was beaten by both Lee Sangsu (11-6, 11-6, 11-8) and narrowly in five games by Jeoung Youngsik in the fifth and decisive match of the fixture (11-9, 11-7, 9-11, 4-11, 11-5). The one remaining Korea Republic success came in the third contest when Jan Woojin overcame Ng Pak Nam by the very minimal margin (11-5, 11-7, 8-11, 8-11, 11-9). Defeats for India and Hong Kong but their only defeats of the day; they can look forward to quarter-final places. Teams finishing in first and second positions in each group advance to the main draw. The group stage concludes on Monday 27th August, it is also the day on which the quarter-finals will be played.